Protect your baby from being damaged by cabinets and drawers, taking care of the safety of every lovely baby precisely. 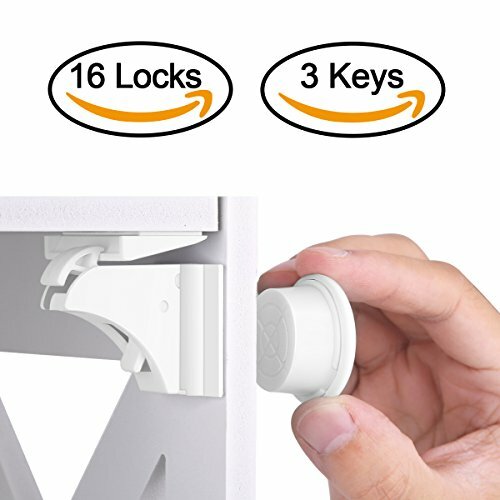 These baby magnetic safety locks adopt extremely strong 3M adhesive tape, environmental ABS material, sticking to your furniture without leaving any scars on the surface. With adhesive tape, you don't need to use any tools or screws to install, saving your time and effort greatly. When your baby is not at home? You can turn to the unlocked mode by clicking it, switch to normal open function by canceling the unlocked mode. With magnetic and human design, these safety locks can reach an ideal magnetic effect to 35mm ultimately, fulfill the need of opening of all the furniture. Clean the surface on which the lock will be installed and used. Please allow 24 hours for adhesive to dry before usage for maximum strength against toddlers. Fit for cabinets and drawers that thickness is under 30 mm. Safety Baby Proof Design - Locks keep curious little kids away from drawers and cupboards filled with dangerous tools or chemicals. Practical & Easy Installation - Install the locks with adhesive tape provided in the proper position. You don't need any tools or screws to install. No damaged leaving on any cabinet drawer furniture surface. Invisible from Outside - Locks install inside cabinet or drawer, completely concealed from children and guests, making your home more appealing, while also providing ideal child protection. Humanized Design - With normal open close function (unlocked function). You can use this function when you baby is not home or sleeping. One key can open all locks. Ideal for Home Use - Come with 3 key & 16 locks. ideal home supplies for cabinet, drawer, cupboard etc. Backed by one-year warranty, free replacement or full refund. If you have any questions about this product by HURRISE, contact us by completing and submitting the form below. If you are looking for a specif part number, please include it with your message.